The South Mokanger Woolshed complex is located on the south side of Mokanger Road about 8.0kms east of the township of Cavendish and opposite the continuing Mokanger property. The bluestone woolshed was built in 1864 after the original timber woolshed burnt down. No architect or builder has been associated with the construction, although architects and engineers did design substantial woolsheds in the district at that time. It is said that the stonemasons were Scottish. There is nothing particularly unusual in its design, as at Kolor and Banemore. Rather, the woolshed is typically conservative and well built. The nearby stone cookhouse, which probably dates from before 1864, and the later men's quarters, are standard. Thomas and Andrew Chirnside, two of the earliest, most important and most successful squatters in Victoria, owned Mokanger at the time. Edward Barnett had taken up the Mokanger run in the early 1840s. The Chirnsides obtained the squatting licence in 1846 and held it until 1876. The Chirnside family was based at Werribee Park, Wyndham but visited Mokanger and used it to raise thoroughbreds as well as to grow wool. Mokanger, Mount William and Mount William Plains were known as their Wannon runs. In 1885, Alexander McEdward, another absentee landlord, purchased Mokanger. When his widow Alexandrina died in 1900, the AML&F Company took over the freehold land. In 1910, John William and Alice Gardner purchased Mokanger. The homestead block was sold in 1876 but the Gardiner family retains the 1864 woolshed and continues to use it. The three buildings retain a high degree of integrity and are in good condition. The South Mokanger Woolshed complex is of historical and architectural significance to the southern Grampians Shire. 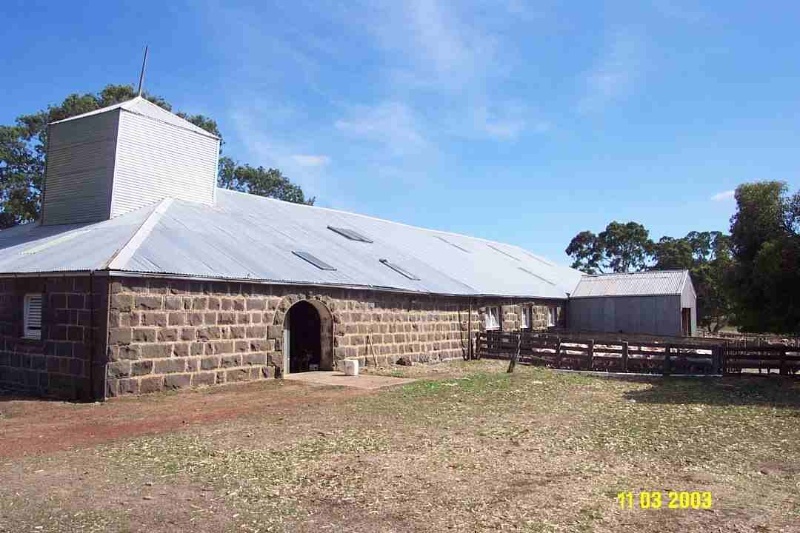 The South Mokanger Woolshed complex is of historical significance for its direct associations with Thomas and Andrew Chirnside, two of the most important pastoralists in Victoria. The South Mokanger Woolshed complex is of architectural significance as one of the finest and best surviving woolsheds in the Western District, reflecting the values, interests and capacity of the Chirnsides, notwithstanding their absentee landlord status. The woolshed is in excellent condition. The men's quarters are now in excellent condition. The bluestone woolshed is rectangular in plan with a low pitched hipped roof now covered with corrugated iron but previously slate. It has new external holding pens at the north-east end and the original timber internal pens down the centre for two thirds of the length of the building. Originally there were shearing boards on both sides but now the west side has been converted for holding sheep by replacing the floorboards with slats. The table and press (originally a Ferrier press) are located at the southern end. Of interest is the timber walkway above and around the holding pens, said to have been installed to help manage the sheep and to watch the shearers. Also of interest are the paired exits for the sheep. These have swivelled timber windows with four panes of glass. There are four 'windows' in the northern elevation with timber louvres. Below these, but not aligned, are four openings to give access to the sub-floor space. Parts of this elevation have been carefully reconstructed. The three main entrances have large elliptical arches. All openings are detailed with quoins and either bluestone lintels or voussoirs. These and the walls are conventional rockface bluestone. A large corrugated iron engine shed has been added on the east elevation. The woolpress tower (for the screw operated Ferrier press) has been clad in corrugated iron. The original men's quarters are also bluestone and are some distance from the woolshed. After recent conversion to a holiday rental cottage they now comprise a large living room, two bedrooms and a kitchen. There is a simple timber verandah on the east elevation. The original fireplace, oven and chimney have been demolished. A new bathroom has been added on the western elevation. The nearby mid-twentieth century quarters and bathing facilities built in timber and fibro-cement are not considered to be significant.